The Compugraphic 7200 and 2900 photocomposition machines allow operators to enter text using a computer and write the information to tape. This tape is fed into a phototypesetter which imprints type from a strip of film onto light-sensitive Kodak Ektamatic paper. The image below is taken by Dan Wybrant during the production of the Daily Titan in the 1970s. 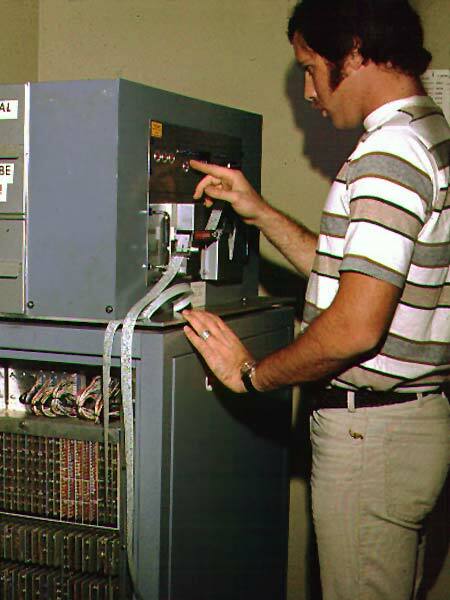 It shows the operator feeding a paper tape in a Compugraphic 2961 phototypesetter. The galleys of text it produces are then used for paste-up. Compugraphic combines technical excellence with an aggressive commercial policy. They are the first on the market to openly publish the prices of their machines, something considered ‘not done’ in those days. The market is getting crowded since ATF, AM Varityper, Star Parts and Harris all also introduce phototypesetters. 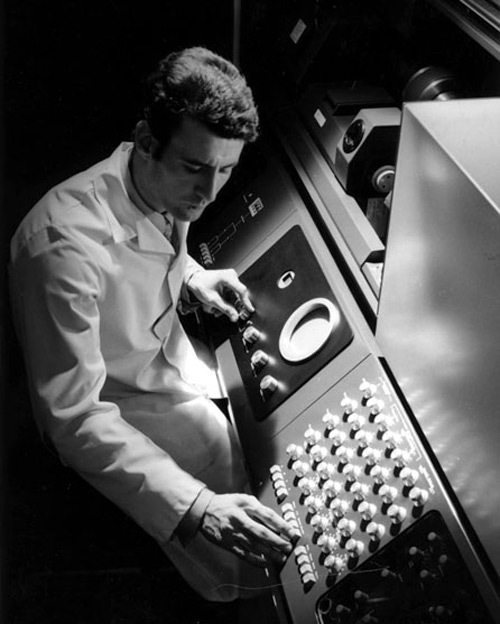 The Times changes the way financial information is published by using an IBM 1130 computer to handle all financial calculations based on share prices. The computer is connected to composing machines to automatically typeset the pages for about 1850 stocks. It needs only two-and-a-half hours for a task that was previously done by dozens of people working through the night. Charles F. Goldfarb, Ed Mosher, and Ray Lorie start working on a text structuring mechanism which in the mid-70’s will evolve into SGML (Standard Generalized Markup Language). This will eventually become the basis for both HTML and XML. ECRM is founded by three MIT professors and a guy from Associated Press. It develops one of the first commercially successful optical character recognition (OCR) machines. Ken Thompson from Bell Laboratories starts working on an operating system called Unix. It will become the basis of many typesetting systems and is still widely used today. Apple’s OS X, for instance, is a version of Unix. The Crossfield Magnascan scanner, launched at the Milan printing fair, can scan a color slide and create a resized color corrected set of film separations for inclusion in a magazine, catalog or other publication. Robert Trogman creates Blippo, a headline typeface. ‘Sesame Streets’ debuts as a pioneer in educational television. The Boeing 747 makes its maiden flight. Around 500 million people worldwide watch Neil Armstrong takes his first steps on the Moon. Many of the top rock musicians of the era perform at the Woodstock Festival in upstate New York. The first message is sent over ARPANET, the forerunner of the internet.